Posturing is the body’s positioning, both laterally and longitudinally. Proper Alignment is created by Proper Vertebral Placement. Proper Vertebral Placement means the vertebra are properly lined up, whether the horse is on a straight or a curved line. Proper Posturing and Proper Alignment go hand in hand, as do Improper Posturing and Improper Alignment. Proper Alignment is often referred to as straightness, and Improper Alignment is as crookedness. I prefer not to use the term straightness because it can be misconstrued to mean that the body is actually straight. While this is true when the horse is moving on a straight line, this is not the case when the horse is traveling on a curved line, such as a circle or turning a corner. The horse is considered to be straight when the horse’s body is actually bent, or curved, from nose to tail to the same degree as the curved line upon which the horse is travelin g. This can be a point of confusion, so I prefer to use the term aligned. The horse is Properly Aligned when the horse’s body is straight from nose to tail when traveling on a straight line, and bent, or curved, from nose to tail to the same degree as the curved line upon which the horse is traveling. This horse also possesses Proper Lateral Posturing. If you were able to float in the air directly above the horse when the horse is traveling with Proper Alignment and Proper Lateral Posturing, you would see that the entire top line of the horse adheres to the line of travel. 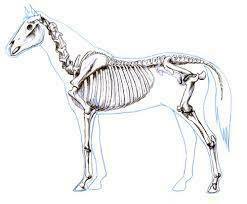 If you had x-ray vision, you would see that the horse’s spine adheres to the line of travel. The second best way to view the horse’s Lateral Posturing and Alignment, whether it is Proper or Improper, can also be seen by standing directly in front of or directly behind the horse’s body. Since the horse’s entire body hangs below the spine, everything that occurs in the vertebra is reflected in the horse’s body. A Properly Aligned spine (the vertebra are properly lined up) in a horse that is traveling with Proper Lateral Posturing equals a Properly Aligned skeleton. Most importantly, the joints are Properly Aligned. Another way of saying this is that the bones in the joints are properly stacked. By the same token, an Improperly Aligned spine in a horse that is traveling with Improper Lateral Posturing equals an Improperly Aligned skeleton. The joints are Improperly Aligned. Another way of saying this is that the bones in the joints are improperly stacked. This causes uneven and excessive wear to the joints which eventually compromises the integrity of the joint and proper joint function. By the time the horse exhibits unsoundness, such as lameness, damage has already been done. In addition to Lateral Posturing which can be viewed from directly above, in front of, or behind the horse, there is also Longitudinal Posturing which can be viewed from the side of the horse. Longitudinal Posturing is the line created by the top line from the horse’s face to the top of her tail. An example of Longitudinal Posturing would be the head and neck in the air and a hollow back, and an opposing example would be the front of the face approximately on the vertical, the neck rounded and the back lifted. The faster the Movement, the harder the joints are worked, and the stronger the concussion is. The more weight the horse is carrying, whether it is her own body weight or the weight of a saddle and a rider, or even just a rider, the more force is created on the vertebra and the joints. The harder the footing, the more force is exerted on the joints from the increased concussion. Even when the joint is in the early stages of uneven wear, before any obvious signs such as lameness appear, it begins to be more prone to injury, and the more the joint becomes compromised, the more prone to injury it becomes. Proper Posturing and Alignment also creates Proper Symmetrical Muscular Development. It is the muscles that hold the skeleton in place. By the same token, Improper Posturing and Alignment creates Improper Asymmetrical Muscular Development. In this case the muscles actually hold the skeleton in misalignment. In my last article, I talked about Unnecessary Tension and Total Relaxation (lack of Unnecessary Tension). In order to create Proper Posturing and Proper Alignment, the horse must be free of Unnecessary Tension (Totally Relaxed). Total Relaxation, Proper Posturing and Proper Alignment contribute to increased soundness. Unnecessary Tension, Improper Posturing and Improper Alignment contribute to decreased soundness. Horses who have ever suffered an injury. Horses who have been abused mentally/emotionally and/or physically. 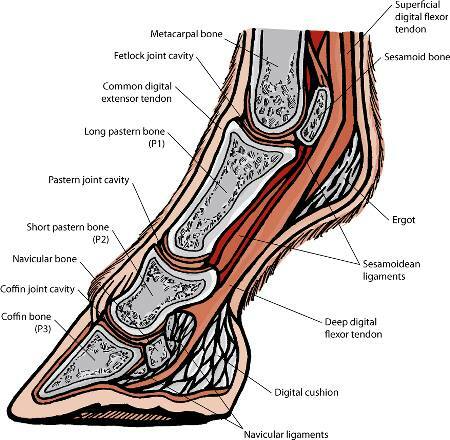 When a horse is injured, compensation occurs, such as (but not limited to) lameness. Compensation creates Improper Posturing and Improper Alignment. If this is not properly addressed, the Improper Alignment tends to remain even after the original injury has healed, thus setting the horse up for future soundness issues and the tendency for more injuries. When a horse is abused mentally/emotionally and/or physically, this creates tension in the horse’s mind, and therefore Unnecessary Tension in the muscles. As you read in the last article, Unnecessary Tension is the biggest cause of skeletal misalignments. When a horse is ridden she is carrying excess weight to one extent or another. While carrying this excess weight, the horse is also subjected to repetitive motion. It is crucial to have the knowledge and skills to assist the horse in attaining and maintaining Total Relaxation, Proper Longitudinal Posturing, and Proper Lateral Posturing and Alignment is crucial in order to keep the horse’s back and joints healthy and sound when being ridden. For those of you who like technical, scientific information “The Secret Life of Bones” is a good read. In order to be truly happy, a horse needs to be sound and free of discomfort. It is up to us to attain the necessary knowledge and skills in order to assist the horse in attaining and maintaining the highest level of soundness possible and to become as comfortable as possible in her body.